Perhaps the most famous of all the Burgundy clos (clos indicates a walled vineyard) it is also the largest single vineyard entitled to a Grand Cru designation, comprising 50.6 hectares. The Clos takes its name from the Vouge stream that separates the village of Vougeot from the vineyards of Chambolle-Musigny. It produces red wine from the Pinot Noir grape. The Clos has a long and rich history linked to the Cistercian monks of the nearby Abbey of Citeaux. Created by land purchased or donated, a wall was built around the vineyards in 1336 and has remained ever since. From the middle ages until the French Revolution, the Clos de Vougeot was considered as the monks’ most treasured site. After the Revolution, in 1818 the clos was purchased by the Ouvraud family until 1889 when it was sold to several wine merchants and divided up into smaller parcels for the first time in its 700 year old history. That subdivision continued throughout the 20th century so that today there are more than 80 different wine growers within the clos. In 1551 the Chateau de Clos de Vougeot was created by enlarging an existing chapel. Today it is used as the headquarters of the Confererie de Chevaliers de Tastevin who organize regular dinners and tastings here. The soils within the large cru are quite varied: At the upper end at about 255 metres above sea-level, the topsoil is only about 40 cm deep, quite rocky and gravelly over a limestone base. In the centre, at about 250 metres of altitude, the soil is still shallow (45 cm), clay soil overlying broken limestone. The lower portion (around 240 metres) has a deep, soil (90 cm) that lies on a layer of marl, clay and alluvium. Due to the huge amount of different wines grown in the Clos, there are lots of different styles of wines made from beautiful Grand Cru bottlings to mediocre offerings trading on the Clos de Vougeot name. The best wines are full bodied, with generous plummy and berry fruit with good tannin and body. They can age well for a decade or so before being enjoyed. A parcel of 40 year old vines which was bought by Gaston Grivot in 1919. 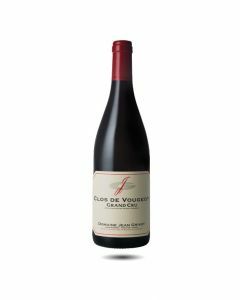 This Clos de Vougeot is full-bodied, powerful, if a little temperamental in youth. A surly infant which develops superb refinement with age and requiring a good ten years to reveal its true potential and finesse. Well-made, generous and silky-smooth with aromas of violets, truffle and a savoury, earthy complexity. It usually requires a good ten years to evolve and to show its true potential. Well-made, it is a generous, silky smooth wine with aromas of violets, truffle and shrubs. Almost ready to drink now. Over the last few vintages, this wine has become more refined and elegant with precise red fruit flavours mixed with notes of spice, flowers and rich earth. High quality grand cru from one of the top growers in the Clos. Great depth and elegance. Finally, after several years of small harvests, the Grivots had both quality and quantity in 2014. Healthy, pure Pinot grapes that were harvested under perfect conditions to produce a lovely wine that is forward and fresh but still has layers of complex flavours as it builds towards the very precise, elegant finish. Gaston Grivot bought this excellent, almost two-hectare parcel of 40-year-old vines in 1919. The Grivot Clos de Vougeot is one of the very best from this famous grand cru and has a brilliant dark intense purple colour, saturated, rich purple fruit with flavours of sloes, damson plums and ripe blackberries. Everything is in balance here, in spite of the density and power and although delicious to drink when young, it will probably be worth aging this wine for a decade or so to show its true potential. This wine has had great success since its release. With the purity and freshness that is characteristic of the Grivot style, this serious wine has flavours of summer and autumn fruits, with an impressive structure and elegant, supple tannins. This wine will have a long life. An attractive, exciting wine bursting with red fruit flavours. Nevertheless, one can sense the structure and the mineral aspect of this wine behind the charming fruits and floral aromas. Lots of richness and density on the finish. Een zeer grootse wijn voor het perceel oude wijnstokken (nu meer dan 50 jaar oud) in Clos de Vougeot. Zoals steeds toont de kwaliteit van Grivot's wijnstokken een indrukwekkende precisie en zuiverheid die we zelden elders zien. Met zijn mooie stevige maar soepele structuur is er een energie en vitaliteit die veel van de wijnen van Grivot kenmerkt in 2015. Helder en donker van kleur, dicht en rijk in de neus met fruitige tonen vermengd met aroma’s van koffie, specerijen en chocolade . De wijn heeft een dichtheid en kracht zonder geforceerd of geëxtraheerd te zijn, wat heerlijk is om te proeven in deze wijn. Etienne Grivot beschouwt dit als de beste Clos de Vougeot die hij tijdens zijn 30-jarige loopbaan heeft gemaakt. Maar let op, dit is een wijn om lang te bewaren en zal goed verouderen gedurende minstens 25 jaar.